The Support Services Division is responsible for providing a variety of services to Sheriff’s Office personnel, and to the general public. The division consists of three sections including Communications, Records, and Sheriff’s Computer Support. 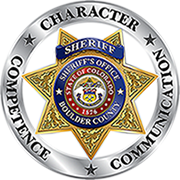 Boulder County Communications (BCC) is a primary Public Safety Answering Point (PSAP) in Boulder County. BCC provides law, fire, and medical dispatch as well as answering both 9-1-1 and non-emergency calls for a considerable amount of Boulder County. This area includes unincorporated Boulder County, Erie, Lafayette, Louisville, Lyons, Nederland, Superior, and Ward. Our staff provides primary dispatch services to 6 Law Enforcement agencies and 26 different Fire, EMS and Rescue organizations. The Records Section Section manages all internal public safety records for the Boulder County Sheriff’s Office and all external records requests coming into the Office by other agencies and by the public. The Sheriff’s Computer Support (SCS) assists in providing data processing systems and services to the Boulder County Sheriff’s Office and the Boulder County Criminal Justice community. The SCS supports the entire Sheriff’s Office with Records Management System (RMS) and Jail Management System (JMS). The SCS oversees a number of the Sheriff’s Office networked personal computers on a countywide Local Area Network. The group also maintains the Mobile Data Computers (MDC’s) that are used by patrol deputies in the field that augment dispatch services provided by Communications.